Motivated by the aforementioned television program and a brief stint in Taekwondo, Teo made her way to a Singapore gym to start training in the “art of eight limbs” nearly eight years ago. What started out as a way to stay in shape quickly turned into requests for Teo to test out her skills against real competition. Teo turned down the opportunity test herself in Thailand, and, after training for two years, she put Muay Thai on the shelf completely as she packed her bags and headed to the United States to study Psychology at the University of Buffalo, where she graduated with a Bachelor of Arts degree. However, school was far from enough to keep Teo from wondering “what if” in terms of martial arts competition. As each day passed, the fire in her to compete grew stronger. With a full life prior to heading to the United States, there was simply no time for her to train, but after concluding her studies, the window opened again. Teo returned to Singapore and dove head-first into the amateur martial arts scene after just a month of training. What was meant to be a one-time experience that she could cross off her bucket list soon turned into something more serious, all because she lost. A far cry from her days in the choir, Teo’s journey to perfect her craft in martial arts progressed quickly. After immersing herself with Muay Thai and boxing, Teo dabbled in the famous grappling discipline of Brazilian Jiu-Jitsu. Before she knew it, the Singaporean was on the road to a full-fledged professional mixed martial arts career. “I fell in love with martial arts. There is more to it than throwing strikes and grappling with your training partner on the mat. It empowers me every single day,” Teo stressed. From the amateur to the professional ranks, there was one battle that Teo fought for every single match that she was booked for: winning the approval of her parents. 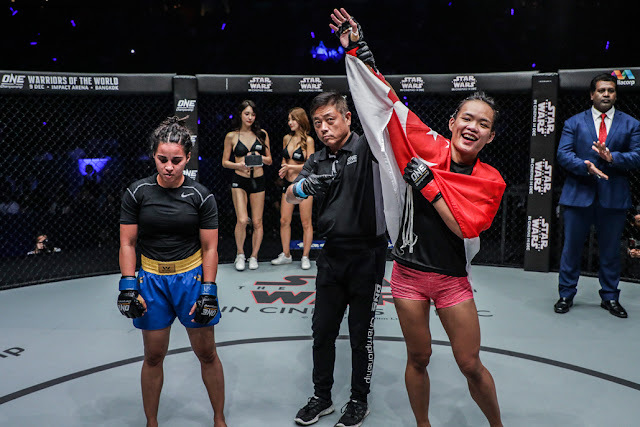 After having her hand raised in seven professional bouts inside the cage, Teo has received the biggest opportunity of her perfect martial arts career as she is scheduled to clash with “The Panda” Xiong Jing Nan for the inaugural ONE Women’s Strawweight World Championship. Both women are set to collide in the main event of ONE: KINGS OF COURAGE, which takes place at the Jakarta Convention Center in Indonesia on 20 January. The 28-year-old Singaporean title contender can make history on that fateful night, but she knows that it will not be easy. “It takes a lot of discipline and hard work to be a world champion. We see how people change after they become the champion, so I feel like you need to stay humble, grounded, and continue to work hard,” she stated. Although Xiong is widely-regarded as one of China’s finest woman warriors, Teo is confident in her ability to win as she is preparing for all possible scenarios for her first-ever martial arts world title contest. “I feel a knockout or submission is possible. She is pretty wild with her punches so the opening for a knockout is there, and an opening for a takedown is there if she is committing to her punches,” she explained. “At the same time, she is tough. She might not get knocked down or knocked out, and she might go the full five rounds, so there are a lot of possibilities and outcomes to this match,” Teo added. 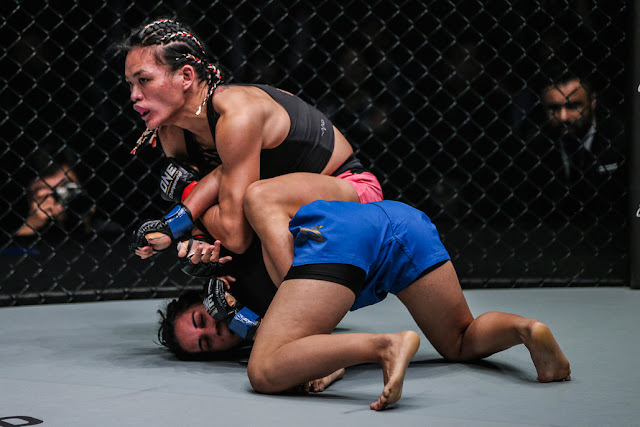 Teo is 100 percent focused on becoming the first-ever ONE Women’s Strawweight World Champion and the second ONE World Champion to fly the Singapore flag, especially after earning her parents’ approval. “My parents are very supportive now, When I first started [competing in martial arts], I told people they were not supportive and wanted me to stop. But now, they are checking on me, my training, my preparations, and are asking about my matches,” she disclosed. With his family and friends behind her, Teo envisions victory at ONE: KINGS OF COURAGE against her Chinese opponent. “They are changing their attitude, and it is really nice having the support of my parents. I am really happy about it. Now, I am so motivated to win and bring home the belt,” she ended.